Some of the concepts that our kiddos need to learn can be quite abstract. Understanding their place in the world is one of them. One of my popular resources covers this difficult concept in a very visual way. I recently gave it a little facelift. 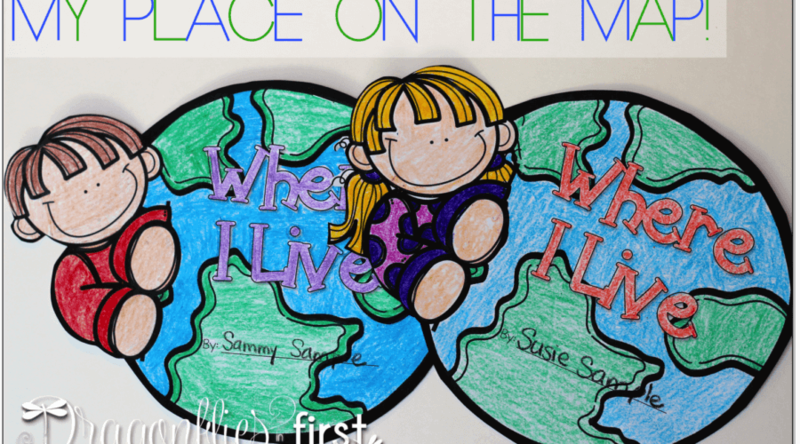 This cutie “cover” will help this fun learning resource stand out on bulletin boards. Behind the cover are pages of varying sizes. These pages help solidify the concept of just how small we are. That little circle is left blank and I’ve included images of all states so that you can personalize it for your area. I generally stack the pages from largest (solar system) to smallest (town). But it really doesn’t matter which order you use. For picture purposes I stacked them smallest to largest so you can easily see the progression. Where I Live also includes some additional activities that are perfect for lead in lessons prior to the culminating activity shown above or as a review and reinforcement activity completion of the project. The resource includes a full-page lesson suggestion. With each theme I place related vocabulary cards on my focus wall. After laminating, I cut them out and place magnetic tape on the back. Then they are easily placed on and removed from my white board. This resource really helps exemplify our place in the world while removing the “abstract” sense that our little ones tend to have about the concept. Click the cover to check it out! P.S. You May Also Like . . .
Have you put this on TPT? Or thought about doing that? I would buy it.